My goal in horseback riding is to have (safe) fun with horses, while understanding horse behavior. My love of horses began while growing up in Pittsburgh, where my father had a camp. I have been riding for over 55 years and have been a horsemanship instructor for 45 of those years. I am a camp director and a HPER Teacher. Born and raised in Dillon, Ron is a Montana native. 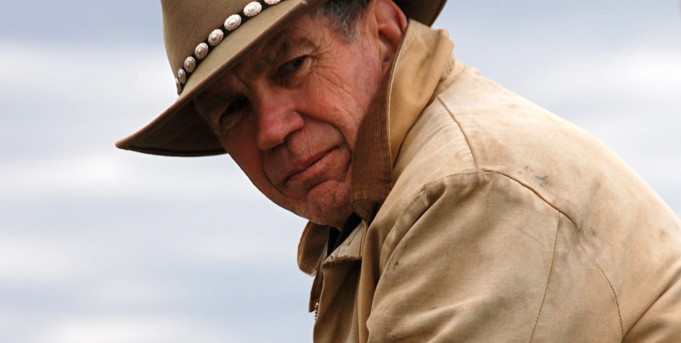 He farmed on the family farm and has worked in varying aspects of the farm and ranch industry. Also earned his degree in Agricultural Business from Montana State University in Bozeman. Ron and Janice met in 2004 at the Wildwest Winterfest. He met his horse RC at an auction and has been been hooked on both ever since! "How many time do you actually get to go to Montana and meet a real horse whisperer? That is what I've been saying to describe you and the magic you bestowed upon me. I had no idea how special the week was going to be or what to expect. You are an amazing woman with an amazing talent. You made me feel so comfortable in an uncomfortable situation. Thank you for your patience, kindness, and trust. Thank you for giving me space to heal, even when I didn't realize there was more healing to do. Thank you for allowing me to ride and be in the presence of those amazing horses." "It feels a bit odd to be home, like I don't totally belong here right now. My heart and soul are still in Montana with you, your lovely homes and your most amazing horses. Honestly, I am in a bit of a dream state and feel so much appreciation towards you and Ron for all the love, care, support, laughter, generosity and kindness you showed to me. I am going to leave Montana horse dirt under at least one finger nail, so that I remember where I have come from. With a heart that is full...so very full of love and gratitude!" "You showed us some of the most beautiful and unusual sceneries, that normal people like us only see in the movies! Thank you for not only being an excellent instructor, but at the same time being a friend! Although we are from thousands of miles away, you made Montana feel like home for us, we can't wait to get back." "There is always something to learn in a non-threatening environment that has been designed to meet the needs of riders with different interests and abilities. I love to ride with Montana Horse Sense because Janice will do the thinking for me and I can relax and learn." "Janice's patience, understanding and teaching background serve as a type of riding therapy for our daughter's learning disabilities. She has taught us, not only the fundamentals of riding and horse care, but how to correct problems, learn from the horse's reactions and to be ready for anything. Janice "matched" Taylor with our first horse (our beloved Savannah) and we are now looking to welcome our 4th addition to our barn. 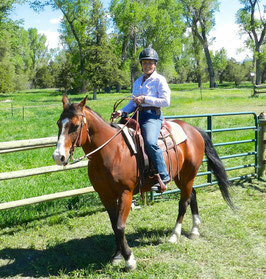 Thank you, Janice, for passing on your love of horses and getting us back in the saddle." "The Owen family would like to thank you for one of our best and most memorable holidays ever. You and Ron made us feel like part of the family and that made it even more fun because we felt so relaxed right from the moment we arrived. Your horses are always a pleasure to ride. The scenery was just spectacular and the riding was wonderful." "As an “aged” member of the Gallatin Valley Backcountry Horsemen, I say again, thanks to you for all you do with your rides, lessons, and in general getting the members involved with horses in a safe manner. . You have made a change in the club as you have brought members together with learning and fun. My handicap(s) and young horse need you, which make an example of what the members have benefited from your endeavors. Thank you from the bottom of my heart."